Taking us on this journey across the Great Barrier Reef is the state-of-the-art research vessel, The Alucia. Loaded with cutting-edge research facilities, a helicopter and two extraordinary deep-sea submersibles, The Alucia is the perfect ship to explore this beautiful underwater world. At over fifty metres in length and weighing in at 1142 tonnes, the Alucia is more than just a boat. A crew of 22 people are needed to operate its helicopter, helipad and the two submersibles stored on board. Despite this heavy load, she can still hit a top speed of 10 knots and can cover an astonishing 7000 nautical miles before needing to stop to refuel. Onboard there is an impressive array of research equipment. The ship carries with it a wet and dry lab, as well as front-line oceanographic surveying tools able to keep track of climatic variables like sea temperature, ocean salinity, wind speed, rainfall, air pressure and humidity. 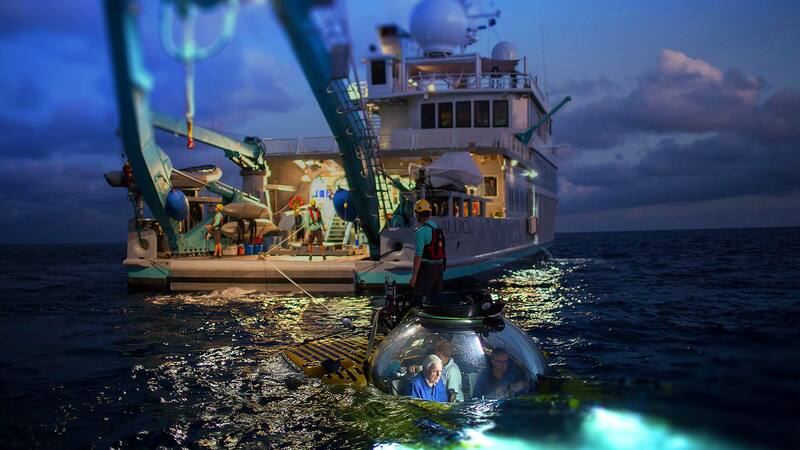 But to fully explore the reef, David will be using the Triton submersible. Capable of diving to depths of up to 1000 metres, a sub of this kind has never before explored the Great Barrier Reef. The 800kg Triton submersible is specially designed for deep-sea exploration. It contains a 17cm thick glass sphere able to withstand incredible water pressures whilst maintaining a spectacular 360-degree view of the reef around it. Should anything go wrong, Triton can survive four days on its reserve oxygen supply.